Pakistan's cricket community lost a great personality, a person who was known as the encyclopedia of Pakistan cricket and someone who most importantly ushered in a new era of sports journalism in the country. For someone who had worked closely with him and under his guidance at News, the genial and colourful personality of Gul Hameed Bhatti will be missed sorely because he set new standards in sports journalism and in encouraging young talent; his passion for cricket rubbed off on anyone who came in to contact with him. Born in Lahore in September, 1947, Bhatti dabbled as a pilot in the national airlines and worked in the public relations department in PTDC before turning to his twin passion of journalism and cricket. In 1973-74, he entered the world of the sports media. He served as the editor of the popular The Cricketer (Pakistan) magazine, which was known as the bible of Pakistan cricket internationally and played a big part in making the careers of several outstanding cricketers. He also combined with Abid Ali Kazi and the late Noman Badar to launch the cricket statisticians association of Pakistan and the annual Pakistan cricket book. It is difficult to really underline here the tremendous contribution Bhatti made to Pakistan cricket but suffice to say if anyone wanted to find out details of some obscure record or details of a particular domestic match played in the '50s or in the '90s, Bhatti Sahib was the final word. 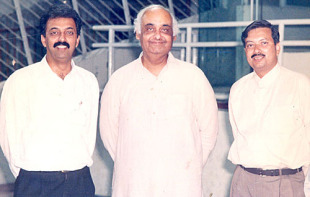 After joining the News in 1990 as its sports editor, he succeeded in changing the trend of sports journalism in the country by making it investigative, colourful and informative while moving away from the existing trend of drab and dull lengthy analyses and the heavy dependence on agency stories. He was an editor who backed his reporters completely. "Tumhari story facts pay based hai, koi angle toh nahi?" was his usual question and once a reporter convinced him his story was factual and correct he had nothing to worry about. Bhatti had the capacity to absorb all the pressures and dissent that came from the top or from angry officials and players and his message to them was clear: "I will back my reporters all the way." He was promoted as the editor of the newspaper but his first love remained sports, a position to which he returned after a few years. Bhatti remained jovial even after the death of his wife, Razia Bhatti, in 1996, herself a fearless journalist and editor of the Herald magazine who later launched Newsline. But the loss of his wife affected him and his health began to deteriorate and after overcoming a bout of throat cancer, he suffered a brain stroke last year and was bed ridden. He passed away on Thursday night after another brain stroke and due to the failure of his vital organs. Even after his death, the contribution and position of Gul Hameed Bhatti in Pakistan journalism and cricket will remain at the top. We will all miss you Bhatti Sahib.